There are two things you need to know about poetry. One: The market for it seems to get smaller and smaller by the year, despite the dedicated and talented artists that continue to create it. Two: Most poetry collections are released by either university presses or small specialty presses. In terms of full books or even collections or anthologies, it can often be hard for poets to find a home for their work. Now, take all of that and imagine trying to find a home for a poetry collection that focuses on the paranormal and unexplained. Luckily, as co-editor of such a developing collection, I was able to find a home for our collection I Know What I Saw: Poems of the Unexplained. The funding and the poets, however, are a different story. Having been a follower of most things paranormal for countless years, I’ve heard varying degrees of eyewitness accounts. I have chiefly been interested in UFOs, although ghosts and all things cryptozoological have also had a grip over me. As a writer, one of the most fascinating parts of each and every account of the unknown comes from eyewitness testimony. Even when the stories are clearly fraudulent and indicate a hoax, the way the eyewitnesses describe what they have just seen can be quite beautiful at times—maybe even a bit poetic. While this one single line was not the inspiration behind I Know What I Saw, I like to imagine what some of those eyewitness accounts would sound like if they were all penned down by professional writers or poets. Anything penned by Carl Sagan, Brian Greene or Neil DeGrasse Tyson on the scope of the universe is bound to be insightful and laced with poetic sensibilities. But what if they were writing about UFOs, ghosts, Mothman, or even demons—and not with a speculative approach, but from that of an awed eyewitness? While few of the poems within I Know What I Saw are based on actual real-life experiences, the book is our attempt at adding a layer of depth and beauty to the unknown. Yes, there is fear and abject terror here, (think sleep paralysis and demonic possession, for example) but there is hope and the want for understanding here, too. The possibility of introducing and intermingling two audiences that are often vastly different is appealing to me. If we can get non-poetry readers that are interested in all things unknown to read a book of poems, this book has served its purpose. The opposite is also true: this book is also about getting a fan of poetry to read about UFOs, cryptozoology or other unknown phenomenon in a way that they have never before considered. Even if you don’t consider yourself a poet, I urge you to give it a try. We all have to start somewhere. Read the guidelines and send us your very best effort. 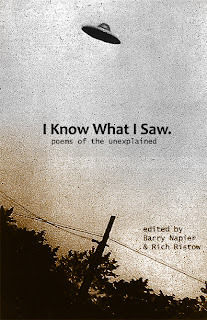 And if you are too uncomfortable with writing poetry but feel that a book like I Know What I Saw: Poems of the Unexplained is important in all the ways discussed above, we would greatly appreciate your support. Any help in the form of links, Facebook and/or Twitter mentions, word of mouth or, best of all, contributing to our Kickstarter campaign would be a tremendous help. We hope to see some work from readers of UFO Digest. If you do submit your work as a result for this article, please let us know in your e-mail. Please send all submissions and questions to iknowwhatisaw@omniumgatherumedia.com.